Redco™ Tuffkast has a combination of strength and resilience resulting in a high performance plastic that offers excellent wear and abrasion resistance with rigidity, minimal water absorption and superior impact values. Ideal for harsh environments where excessive weight, water saturation, abrasion, shock and impact are factors. Your solution to impact and cold temperature applications that cause parts to fracture and crack. Unfilled or natural grade of Tuffkast – yellow in color. High impact resistance with tensile properties and bearing compressive properties. Recommended for applications where factors such as shock, abrasion, vibration, impact, load, and a harsh environment limit the suitability of traditional materials. Special formulation for sawmill carriage wheel applications. V-Wheel & Flat Wheel available. Caution: the steel rails these carriage wheels ride on must be new or must be machined to fit the old worn rails – the tuffkast wheels are the sacrificial part and will fail prematurely if they do not fit the rails properly. Liquid lubricant impregnated within the polymer chain offers excellent surface lubricity for wear resistance and reduced co-efficient of friction. Withstands shock, vibration, and loads up to 4,000 psi. Lowest moisture absorption of any of the Tuffkast or nylon materials. Primarily intended for marine applications. 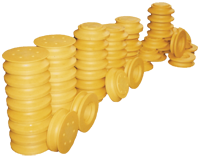 Combines the impact resistance of polyurethane with the wear resistance of a solid lubricant to give the result of the longest lasting material for aggressive industrial applications. 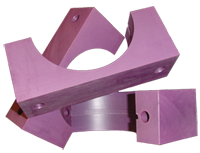 Typically used for dynamic friction applications which are subjected to extreme stress and impact such as bearing blocks, torsion couplings, wear strips, etc. 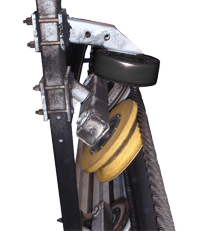 Wear Plates, Dock Fenders/Pads, Valve Seals, Sprockets, Bearings, Bushings , Sheaves , Washers, Spacers, Insulators , Clevis Pins, Ring Gears, Barker Parts, Canter Parts, Carriage Parts, Gland Bushings, Sliding Bearings, Chip-n-saw Parts, Forklift Mast Slides, Log Handling Parts, Bushings for Cylinders, Tube, etc.